The cost involved with transporting these mega boats make you wonder why people even bother. For the cost to get your boat from one marina to another can cost thousands and thousands of dollars. Plus if your boat has seen better days, then why bother? You might be asking yourself “How much does shipping my boat cost” and “Is it worth the cost to me”? We recommend getting a quote on how much it will cost to haul your boat to your final destination and see if it’s worth it to you before committing. Sick of Forking Out For Your Old Boat? 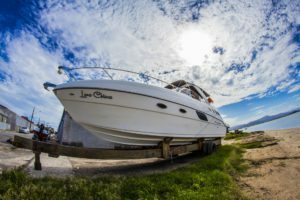 If the cost of maintaining and hauling your boat back and forth from home to Southern Florida has you fed up, you should just sell the old girl. Selling your boat can be a pain, but at least you won’t have to fork out thousands of dollars each year. But where to sell your boat? We’ll that’s where we come in. We here at SellUsYourBoat.net are always looking to buy used boats off their worn out captains. We buy every type of boat, from sailboats to racer boat, fishing boats, cabin cruisers, and personal watercrafts alike. Just tell us about your boat, and we’ll give you a price we’ll pay for it. If you like it we’ll take care of the rest.